Specialink proudly endorses Dignity for all: The Campaign for a poverty free Canada which was recently launched May 22, 2009. The Dignity for All Campaign calls for vigorous and sustained action by the federal government to combat the structural causes of poverty in Canada. Please visitwww.dignityforall.ca to add your personal and/or your group's endorsement of this new pan-Canadian campaign, and to receive or enquire about further information. Priority Idea #1 Inclusive child care services provide an immediate economic stimulus by promoting labour force retention and expansion in the short term (more parents able to work, more caregivers employed) and human capital in the long term (more parents access training, more children with the healthy start that leads to productive adulthood). Priority Idea #2 Expedite Infrastructure spending through federal transfers to provinces to invest in publicly-owned child care facilities and their operating costs. Child care infrastructure spending has maximum local impact as the child care sector is labour intensive and early childhood educators usually live, work and buy in their communities. In addition to providing immediate economic stimulus, public investments in quality, inclusive, affordable, community-owned child care services also leave a social capital legacy that will support families, the labour force and a competitive Canadian economy well into the future. (June 1, 2008 Winnipeg) A 30-year veteran of the fight to achieve universal child care in Canada used her award ceremony to attack the Harper government on the issue of child care. Under the government’s program labeled “universal child care,” the Harper government provides every child under six with 100 taxable dollars a month. “It is a handout with no accountability or standards.” Irwin went on to explain that there are no strings attached to the 100 dollars. Town Daycare’s Irwin was honoured for her life work in child care and in the inclusion of children with special needs. Thirty years ago, she founded Town Daycare centre in Glace Bay, Cape Breton Island, — a program that eventually became a model of quality, inclusive child care for Canada. After 15 years, in 1990, through a non-profit organization she called SpeciaLink, she passed operation of Town Day to a trained staff and took the centre’s commitment and programs on the road. 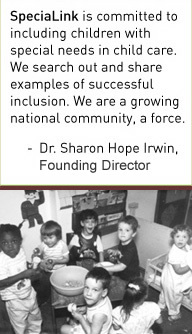 Today, hundreds of child care centres across Canada measure themselves with the SpeciaLink Child Care Inclusion Scales developed by Dr. Irwin. In making the award, President Axworthy of the University of Winnipeg pointed out that this is the first time such recognition has been given to a worker in the child care field. The award ceremony also recognized the new home of the SpeciaLink Centre at the University of Winnipeg, under the direction of Debra Mayer. Improving the overall quality of child-care programs can be an effective way to support the inclusion of children with special needs, according to a new study by a University of Guelph professor. SpeciaLink’s Principle 6 describes the inclusion indicator of “Leadership, Pro-active Strategies and Advocacy for High Quality, Inclusive Child Care”. Even when the regular child care program is available and adequate, many families of children with special needs are excluded by reasons such as staff training, support staffing, transportation, funding and therapeutic support. In fully inclusive child care centres, these limitations are not passively accepted by the director, board, parents or staff. Advocacy activities on behalf of high quality inclusive child care include appeals to civic organizations, work with government officials to change rules that limit the inclusion of children with special needs, and presentations on inclusion to staff, associations and community—these types of actions exemplify fully inclusive child care centres. We ask directors of children’s programs such probe questions as: (1) Does your centre try to change policies and funding arrangements that impede full inclusion? (2) If “yes,” What sorts of actions have you taken? (3) If “yes,” who is involved (such as the director, staff, board, and/or parents)? A national initiative has been created in celebration of the 25th anniversary of both the International Year of Disabled Persons and the first Parliamentary report on disability, "Obstacles", as well as the 10th anniversary of the Scott Task Force Report - "Equal Citizenship for Canadians with Disabilities: The Will to Act". As you may have already heard on November 22, Parliament gave the ‘green light’ to the child care act when the House of Commons voted by 144 to 116 for Bill C303 to send the legislation to Committee for review. The private member’s bill, introduced by MP Denise Savoie (NDP-Victoria), would create standards for child care much like the Canada Health Act does for medicare. The bill received the unanimous support of all NDP, Liberal and Bloc Quebecois MPs present in the House at the time of the vote. Conservative MPs and independent MP Garth Turner all voted nay. Prime Minister Harper was not in his seat. (4) In order to satisfy the criterion relating to universality, the early learning and child care program of a province or territory must ensure that all children resident in the province or territory are equally entitled to early learning and child care services that are appropriate to their needs. (f) indicators of accessibility, such as eligibility criteria and numbers of children receiving subsidies, income levels of parents of children enrolled in early learning and child care services, percentage of children with special needs enrolled and numbers of children receiving services by urban, surburban and rural regions. RAPPORT AU PARLEMENT Contenu du rapport f) les indicateurs d’accessibilité, notamment les critères d’admissibilité aux subventions et le nombre d’enfants qui en bénéficient, le revenu des parents d’enfants inscrits aux services d’apprentissage et de garde des jeunes enfants, le pourcentage d’enfants inscrits ayant des besoins spéciaux et le nombre d’enfants inscrits par région urbaine, par banlieue et par région rurale. The Government of Canada’s Standing Committee on Finance is holding pre-budget consultations across Canada this fall. SpeciaLink has prepared a brief that addresses inclusion of children with special needs, barriers faced by their parents, and the relationship to high quality child care. This is available in an executive summary (document) or you may wish to read the full brief at (document). • How will the federal government’s proposed incentives ensure that “builders” of the promised spaces accommodate access to children with disabilities? • How will the higher costs related to space creation for children with disabilities be addressed? • Finally, will there be monies available so that current spaces can be retrofitted in order to better accommodate children with special needs? The Child Care Advocacy Association of Canada (CCAAC), a partner of SpeciaLink’s, has initiated a national campaign, Code Blue for Child Care, to advocate for a national child care programme in Canada. Support Principle #2 “universally inclusive” in the f/p/t Agreements-in-Principle and in the detailed Action Plans.